What Is the Difference Between a 2/2 & 4/4 Time Signature? Music makes us laugh and cry, march, dance and tap our feet. Besides being one of the great artistic accomplishments of humanity, music is a mathematical construct. Songs are made up of measures, notes and rests. How the notes and rests are played within the measures of a song depends on its time signature. 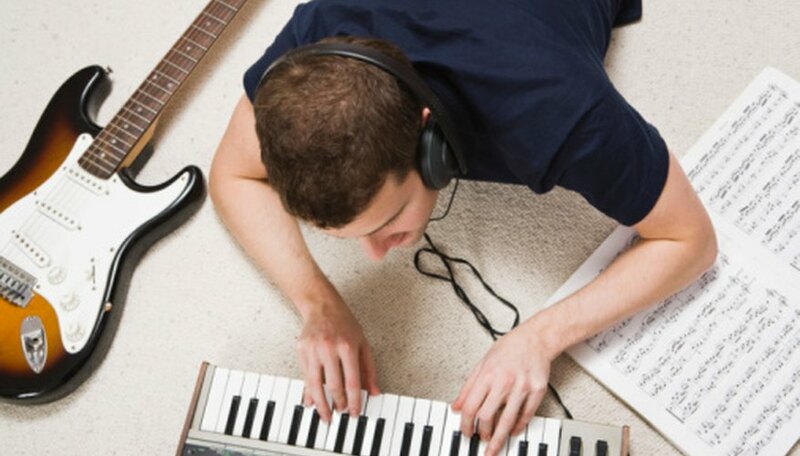 A song can be written in many time signatures, including 2/2 and 4/4. A song is divided up into measures. A measure, also known as a bar, is a section within a song with a specific time signature. The time signature is determined by how many beats are in each measure and which type of note gets a beat. Some types of notes that may get the beat are eighth notes, quarter notes, half notes and whole notes. Sometimes the beat is not on a note but on a rest. A rest is a pause in the measure. The most frequently used time signatures are 4/4 and 3/4, though 2/2 and 6/8 time are not unusual. Because many traditional songs were written in 4/4 time, this time signature is known as common time. The quarter note gets the beat and there are four beats for each measure. Songs with 4/4 time are written for many different genres, including rock, disco, samba, rumba and Motown. No matter what category a song is in, as long as it has four beats per measure and the quarter note receives the beat, its time signature is 4/4. Also known as cut time or cut common time, 2/2 time has two beats per measure with a half note having the beat. Probably the best-known song in 2/2 is “Jingle Bells.” A half note, two quarter notes or four eighth notes get the beat. Each measure has some combination of these notes to make up the two beats per measure that 2/2 time requires. When the waltz was introduced in the 1700s, a new time signature was created: 3/4 time. This time signature has three beats per measure, and quarter notes get the beat. This creates an “oom-pa-pa” cadence to the song. “Rock-a-bye Baby” is a good example of 3/4 time. A 6/8 time signature is also popular; one example is “You’ve Really Got a Hold on Me” by Smokey Robinson. Other time signatures in use today include 12/8 and 5/4. Pink Floyd's “Money” has an unusual time signature of 7/8. What Does "Rain Man" Really Mean?